If you're into case modding and want a motherboard that has killer looks, the Albatron PX845E fits the bill! 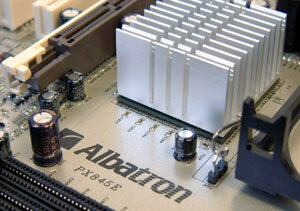 In terms of performance, the board is very fast considering the memory only runs in PC2100 mode. With a street price of around $160 CDN ($90 US) the board is a tad more expensive than comparable offerings, but with the silver coating that is to be expected I suppose. Other than a slightly elevated price, there really isn't anything to complain about here. This is a no frills motherboard; the only on board peripherals being 5.1 audio and a memory stick/smart card header. The layout of the motherboard is really nice, and as far as case modders are concerned the silver coating will make this one very unique system. Wether or not the silver adds in any large or small part to better system performance is anyone's guess, but in our testing system stability was very good. If you're searching for a good looking motherboard, or are simply interested in a little overclocking the Albatron PX845E Silver is a good motherboard to consider.